I suggest reading through these instructions a few times because it turns out that one of the secrets to great playdough is to move quickly and get through each of the steps while the play dough is cooking.. after you make it a few times you will realize exactly what I mean. I also highly recommend having all of the ingredients measured out and right next to your stove for easy access and wax paper set aside to knead dough on immediately after it is cooked. 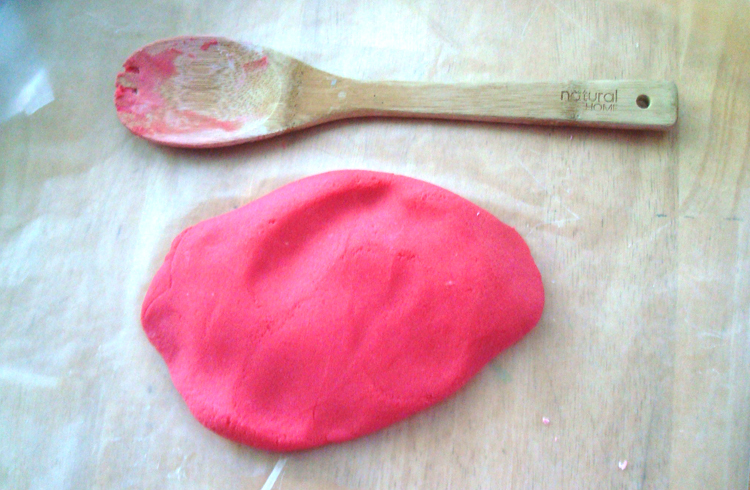 Continue to vigorously stir play dough until a soft but well mixed ball of play dough forms (about 3-5 minutes), there should be nothing left in your saucepan, it all forms a ball if the playdough is set right. Remove the ball of play dough and press it out on wax paper, begin to knead as it is cooling, I let mine cool for about 30 minutes and kneaded occasionally. It is now ready for use and storing! It stores well in ziplock bags and plastic tupperware. Thanks Tara, and actually super easy!